People still dig vinyl records. Of course, you, as a swinging Lounge Revivalist, knew that already. A big deal was made this year when Jack White cut a live version of the title track to his album Lazaretto, rushed it to press, and had the vinyl in-store for sale the same day. And fans, and a lot of the media, acted like they’d never heard the phrase “publicity stunt” before. White’s vinyl had some interesting special features: A hand-etched hologram; hidden tracks beneath the label; Side A played from the inside out; And Side B had a matte finish. Vinyl enthusiasts say LPs sound “warmer” and truer to the original analog signal. Their digital opponents say that warmness is actually a muddy signal due to poor recording or playback equipment. This debate has gone on since the compact disc was introduced to the public in 1982 and it’s unlikely to be resolved. Ever. But the debate itself begs the question: If sound quality truly is the reason some people like vinyl better, why did Jack White need all the bells and whistles for his same-day release ? The answer is simple: People aren’t necessarily buying vinyl because of the way it sounds. Of course, Lounge Revivalists have known this since the early 1990s. How many of us started listening to Lounge music simply because we were in a thrift store and bought an old Martin Denny or ¡Esquivel! LP for 25¢ just because we liked the weird retro cover ? And, from there, how many of us went down the musical rabbit hole and found a certain je ne sais quoi in the process of listening to vinyl? For those in the know, vinyl is active listening. And like a Zen Buddhist monk focusing his mind on the present moment, all the pre-music rituals of vinyl – admiring the cover art, cleaning the record, preparing the turntable, adjusting the equalizer, moving the cat from the favorite listening spot – are just preparing one’s mind for the sonic “now.” If he were alive today, Alan Watts would be impressed. Unfortunately, despite its renaissance, vinyl is really only selling for new releases and really only for modern rock music. Back catalogs and other genres aren’t making the scene. Fortunately for us retro cats into Lounge, Exotica, Surf, 60s style Garage Rock, and even Punk, we have a music label bucking the trend: Dionysus Records. If you’re a regular listener to Ultra Swank’s affiliate podcast, Cocktail Nation with Koop Kooper, you’ve probably already heard some Dionysus tracks from The Martini Kings and The Alika Lyman Group. An elegant encouragement is the 7″ limited-edition release by Robert Drasnin pictured above. Having spent the most of his career as a composer for film and television, Drasnin has only two albums of non-film related music to his name – Voodoo (1959) and Voodoo II (2007). Considering this limited output, he has nonetheless become something of a minor legend in the Lounge Revival and Tiki communities. And that reputation largely comes from the music on those two albums. 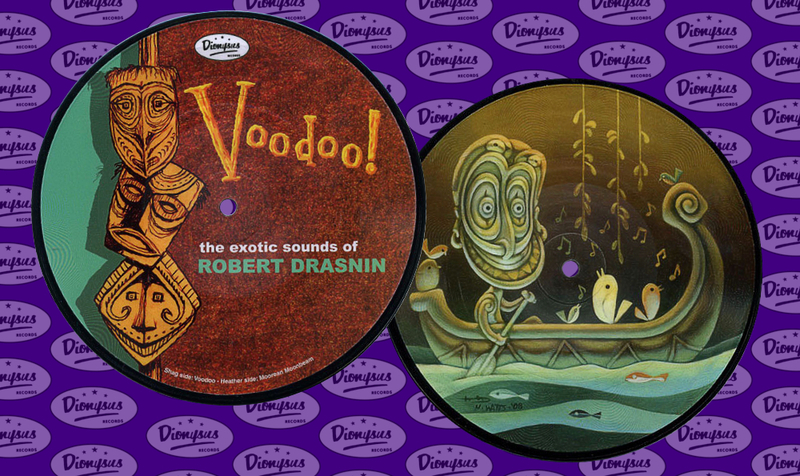 The picture disc samples two tracks, one from each album: “Voodoo” from the 1959 album of the same name and “Moorean Moonbeams” from the 2007 sequel; Side A features the CD re-release cover art by SHAG; Side B features all new tiki art by Heather Watts. Clearly, as with any picture disc, the point isn’t the music alone. It’s a whole experience that demands tactile interaction and appreciation of its visuals as well as sonic assimilation. And there’s also the thrill of being part of a select group who own a limited-edition objet d’art that will spend as much time making your bachelor pad look good as well as sound good. You won’t get that if you hang an iPod on your wall. If you’re a connoisseur of unusual vinyl, this a great piece to add to the collection. If you haven’t yet had the vinyl experience, the disc’s $10 price makes it an excellent entry point for newcomers to either Robert Drasnin or vinyl collecting. Disclosure: A copy of the reviewed item was provided by the publisher to Ultra Swank’s reviewer free of charge.